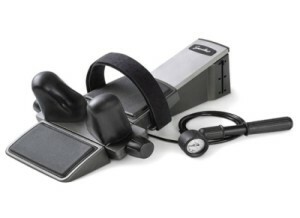 The Saunders Cervical Traction device is a very advanced and effective traction device. It is ready to be used right out of the box. It is fairly light (only 12 pounds) and comes with a convenient carrying case allowing it to be portable. Bring it with you everywhere! The Saunders Cervical Hometrac Deluxe 199594 device will be reviewed based on five categories: results, durability, ease of use, comfort and price. Each category will be given a score out of 5. And an average will be taken to determine the final rating. This particular device applies up to 50 pounds of traction with a patented unique pump and a gauge which reads the pressure. The angle is adjustable to 15 degrees, 20 degrees and 25 degrees. I tried this device and instantly fell in love! I felt results nearly immediately. It was much different than other neck traction devices I’ve tested. One person who suffers from 2 bulging cervical disks saw immediate improvements after using this model for 15 minutes a day for just over a month. They’ve said it was much better than the 10 epidural injections they’ve had. This Saunders model is extremely well-built. For the price, you are receiving a quality device which will last you a long time. For a home-based model, each part is made with quality in mind. Both the pump and head pad are built to last. This device does not require any assembly. Therefore you can use it right out of the box! The device comes with directions and they are extremely easy to follow. You can even call the manufacturer if you need additional details. This traction device includes soft self-adjusting wedges to place behind your neck thus making the device extra comfortable. Also included is a head pad and strap which results in a pleasurable experience. You must lay down to use the model which I find much more comfortable than sitting in a chair which is needed for the door hanging models. This model is definitely one of the more expensive cervical traction devices on the market. However, I consider this one a “professional” traction device which is A LOT better than the door hanging models or water pressure models. As a result, you “get what you pay for”. Being more expensive than some other deivces, it automatically loses a few points in this category since not everyone can afford it. Overall, this Saunders Hometrac Model 199594 device gets a score of 4.6 out of 5, which is one of the highest scores of all devices we’ve reviewed. Given its level of comfort, effectiveness at relieving pain and discomfort in the neck/shoulders, the price tag is definitely worth it. You will not regret your decision. If you have experience with this neck traction device, please leave a comment! We would love to hear about your experience so we can modify our review if necessary! Disclaimer: Please consult with your medical professional before using this product. Depending on your circumstances it may not be safe.